Seldom has the Bohemian world of 19th-century Paris, with its young writers, painters, philosophers, and the women they love, been brought to life more vividly than in this broadcast. 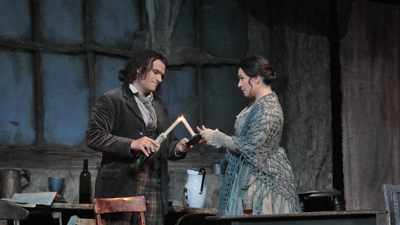 Young Giuseppe di Stefano’s charismatic Rodolfo is the embodiment of romantic ardor, and Bidú Sayão brings charm and personality to her portrayal of Mimì. Together they make a couple to sweep audiences off into the land of first love at its most beguiling. The great Cesare Siepi, in his first Met season, is a delightful Colline.